Director Edgar Wright of DNA and The Mill joined forces to create the music video for 'Gust of Wind,' Pharrell Williams' single feat. 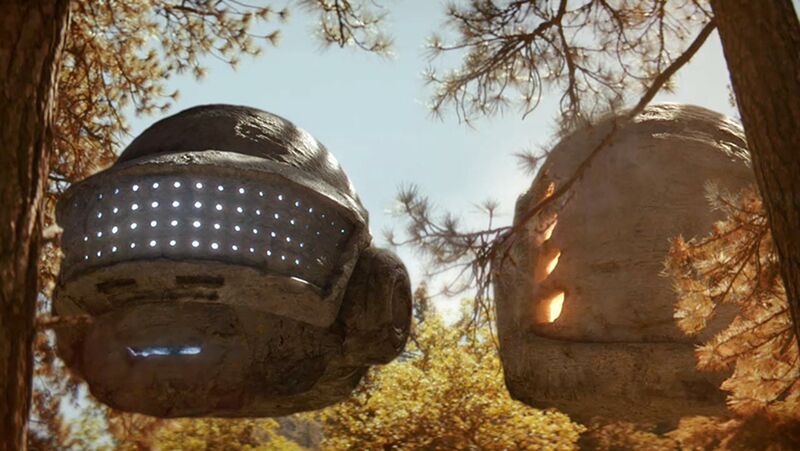 Daft Punk from the album G I R L.
The video takes place in a mystical forest complete with dancers, aerialists and choreographed hand-clapping as Pharrell winds his way through the autumn scene. Hints of the French duo appear throughout with two large, floating boulders shaped to match their iconic helmets and, later on, their silhouettes stenciled into the cosmos. 2D lead artist Nick Tayler guided The Mill team through the complex project. Tayler spoke to us about the cooperative nature of the video: "From the outset we could tell that there was going to be nothing ordinary about this music video, and bringing Edgar's vision of a forest alive with magic meant an opportunity for us to indulge in combining our team's many facets of 3D artistry with matte painting, color grading and detailed compositing to fill the piece with rich detail. Assisting Edgar on set was very collaborative and meant that we were able to shoot specific practical effects, including interactive lighting, to prepare our shots for the animation work that would later follow." 'Gust of Wind' joins a number of projects between The Mill and Pharrell. View them here.